They just don't make enough New York mob movies anymore, something I was reminded of by the endearing Rob the Mob. Director Raymond De Felitta clearly loves this kind of film, long on New York iconography and staffed by a panoply of Italian-American actors who directors like Sidney Lumet and spiritual descendant Spike Lee kept working for years but have fallen out of fashion with the retirement of The Sopranos. 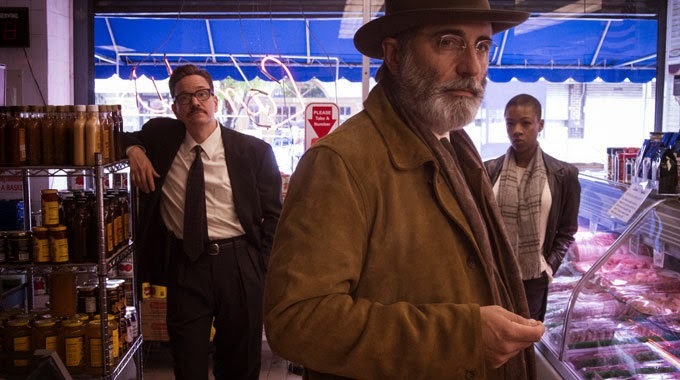 In Rob the Mob, they play up the uncertainty within organized crime circles during the John Gotti trial, a time when bosses like Big Al Fiorello (Andy Garcia) warn their subordinates to keep a low profile, lest they bring down upon them the full wrath of the Feds the way the flashy Teflon Don did. The problem is Tommy Uva (Michael Pitt) and his lover Rosie (Nina Arianda) see an opportunity there for them to cash in. Tommy continually sits in on Gotti's trial to obtain addresses for the "social clubs" where these mobsters congregate. Then he robs them blind, with Rosie driving getaway, figuring none of these guys are going to call the cops. Sal (Michael Rispoli), Big Al's chief lieutenant, wants to quash these bugs, but the two must communicate silently, spelling out words in the boss's Italian gravy because Feds like Agent Hurd (Frank Whaley) are listening in. "Eagles don't hunt flies," Big Al tells his underling. That's good for Tommy and Rosie, who might skate out of this with just a scare. But Tommy gets lucky, or unlucky if you think about it, and ends up finding "The List" among the loot taken from one doddering mobster (Burt Young), the list that explicitly links all of these hoodlums under one criminal organization. That and Rosie's ill-timed interview with reporter Jerry Cardozo (Ray Romano), one where she and Tommy are suddenly blown up to Bonnie and Clyde proportions, might just be the impetus for Big Al to finally push the button on the two thieving lovebirds. Though based on a true story, De Felitta strays from the facts to propose some backstory for a couple of his characters. 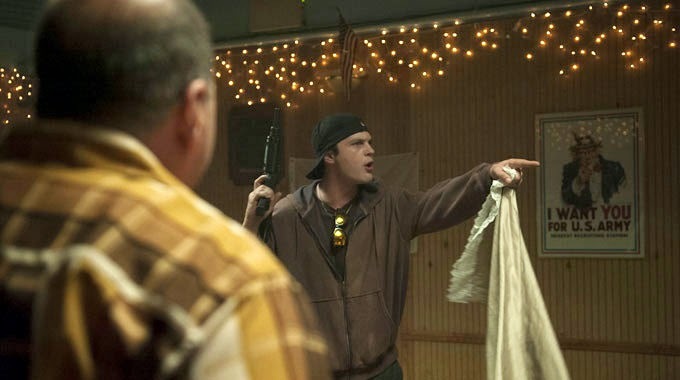 Using the occasional flashback—often in varying film stock, either in black-and-white or oversaturated color—the filmmaker fills us in on Tommy's motivations, illustrating how the intimidation and ultimate death of his hard-working dad at the hands of a couple of made guys has contributed to the giant chip on his shoulder when it comes to mobsters. "For Frank Uva," he declares as he exits every one of his robberies as if that isn't a self-defeating way of surrendering his anonymity. If Tommy is nursing a death wish, then Big Al is pondering his own mortality. Once a struggling restaurateur who just happened to fall into the business of crime, he still mourns the loss of his successor, son Bobby, and has decided to spend his dwindling days out of jail teaching his grandson how to celebrate good food instead of regaling him with yarns about his criminal enterprise. Big Al feels there's only a short span of time before the boy will change his opinion of the grandpa he idolizes, and he means to make the most of it. Unfortunately, Tommy's interference with Big Al's dealings has inexorably set them on a collision course. Rob the Mob has fun with Tommy and Rosie's near-comical crime spree, but De Felitta never forgets that their antics are a hair away from getting them killed. That's too bad because in another life, De Felitta implies, Tommy and Big Al might have been the right men to fill in for the relatives each of them lost in their cruel business of choice.